But lets face it, I’m a lazy sod which means it’s a case of pat dry and get dressed for me in most cases, even then I still find it a chore (yep, I am that lazy). Vaseline Spray & Go is a Moisturiser in a can! What an ingenious idea and WHY was it not thought of before? It is the best thing I have bought all Summer and I can’t get enough of the stuff! It’s simple and effective and I actually enjoy using it. It must have been developed with the likes of lazy swines like myself in mind, because not only is it really easy to use, but the stuff takes no time to absorb or sink into the skin either. Meaning you don’t have to stand around half naked in your room for several minutes before you can get dressed. NO ONE has time for that, because despite what they show us on TV and unlike the models in these adverts, my morning times are not as easy, peasy, bright and breezy! 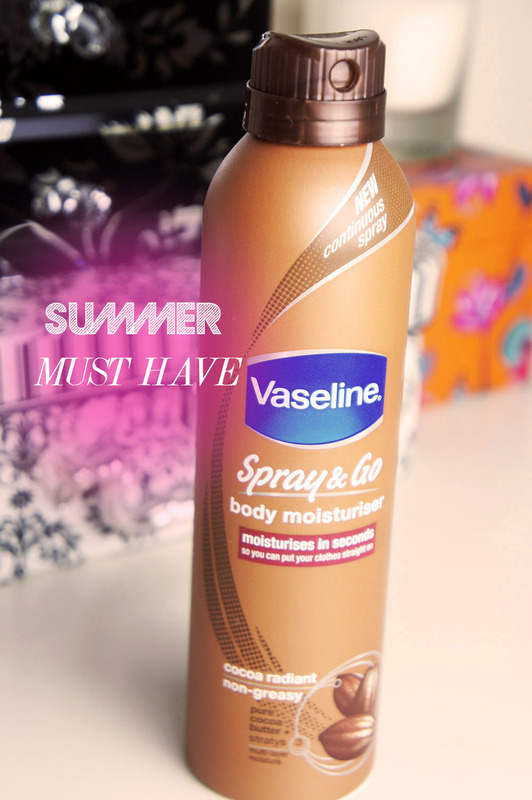 The Vaseline Spray & Go definitely gets my approval as a Summer Beauty Must have ! Especially after last week where we’ve been having some really hot weather. This stuff did wonders for my dehydrated skin PLUS it worked great for cooling me down in the Heat. I’m not lying when I say that it is a pleasure to use, there are three fragrances and I got Cocoa Radiant which smells super gorgeous! The scent also gets left on the skin which I think lasts a good few hours. You hold the can a few inches from the skin and spray continuously to the areas that you’re targeting. It falls on to the skin in a mist but quickly turns into a lotion as you blend it into the skin. I love that it leaves the skin feeling fresh and not at all sticky. My skin definitely looks healthier and less dry for it. I hate the feeling of sticky hands after blending in body cream but you will be pleased to know that I’ve not had this problem with the Spray & go. The Vaseline Spray & Go is £4.99 and you can get it from Boots HERE. It isn’t ludicrously expensive but it isn’t the largest or longest lasting size either, but then again I’ve spent more on creams that I’ve not used and ended up throwing out. I definitely will be repurchasing this when I run out and am secretly hoping that they will come out with a facial version of this too! Have you tried this? Do you think its a great idea or just another gimmick? Tags: Body Lotion, Moisturiser, skin care, Spray & Go, Vaseline. Bookmark the permalink. Previous post ← SCHWARZKOPF FRESH LIGHT CLEAR ASH HAIR DYE [REVIEW]: Toning down red tones. Oh a spray lotion, this is brilliant!!!! I like the idea because I’m very lazy and when I use body cream every day it isn’t for long times… I often have my shower super late both when I have to go out or go to sleep. It would be very helpful! This always reminds me of spray on sunscreen. It just makes the whole process easier. I have to agree that I am also pretty lazy with applying lotion other than on my legs after I shave. I just have no patience for it. I was actually so close to buying this product over the weekend, but I decided against it because it was a little pricier than I thought it would be. Sigh. I should have just bought it!